The villagers of Karalewadi, Mandawane, Bhiwapuri, Hedavali, Ambewadi and Phanaswadi are stranded due to the bridge that joined their villages to the Karjat city collapsed. 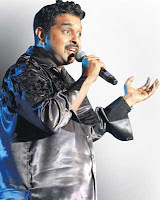 The reason behind the bridge collapse is blamed on singer Shankar Mahadevan. According to the villagers construction on Mahadevan's farmhouse, spread over 2.5 acres near Karalewadi, was given by the local gram panchayat six months ago, and construction work began three months ago. They allege that the 13-foot-wide and 50-foot-long bridge fell down due to the construction work on an illegal compound wall at Mahadevan's farmhouse located close to the bridge. According to Santosh Bhopee, sarpanch, Karalewadi, said, “The panchayat had only allowed construction of a bungalow. 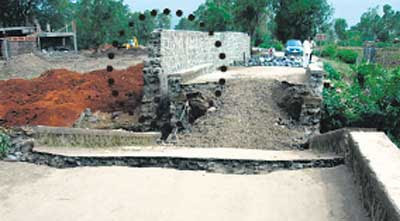 Mahadevan, had not taken permission to construct a compound wall. The contractor used JCB cranes to dig up soft soil near the stream that runs beneath the bridge to create a foundation for a 12-foot high wall. It weakened the foundation of the bridge. leading to its collapse." The villagers in Karjat find that concrete walls built by farm owners create problems as during the monsoons they do not allow the natural flow of water and tend to cause entire villages being flooded. The villagers request farm house owners to not build walls but to fence their farms instead so they can avoid their villages from flooding. Food code - Flavors of Punjab - is a refreshing change compared to the limited number of restaurants in Karjat. Located on the College road in Dahivali, Food Code has a spacious dining area overlooking the Karjat-Murbad highway and they serve Tandoori, Indian and limited Chinese dishes. Located on the Chowk-Karjat Road, the restaurant churns out local delicacies like Vada pav, misal pav, tasty South Indian cuisine and Indian fare as well. Just at the corner prior to Neral phata lies Lucky's Korner, specializing in a variety of dishes at a good price. Lucky's has probably the best chicken tandoori at a good price! Although there are a variety of places to eat in and around Karjat, sometimes the need arises to have a cuisine that is not spicy, like most of the food served in this region. Dada's Grill, which is located in Takve village on the Karjat-Murbad road while going to Kashele, offers a welcoming treat for the taste buds. Well there is no major bread manufacturer that supplies bread in Karjat, not because they don't have the reach but perhaps due to this little bakery that floods Karjat with not only bread, but a range of edibles like Nankaties, Khari Bisucits, Toasts, Pastries etc. Below are the train timings from Mumbai to Karjat, you can also find the train timings from Pune to Karjat.